Don’t wait until you graduate to think about college. At Pisgah you can earn college credit for classes you take while still a high school student. Best of all these options are tuition free! 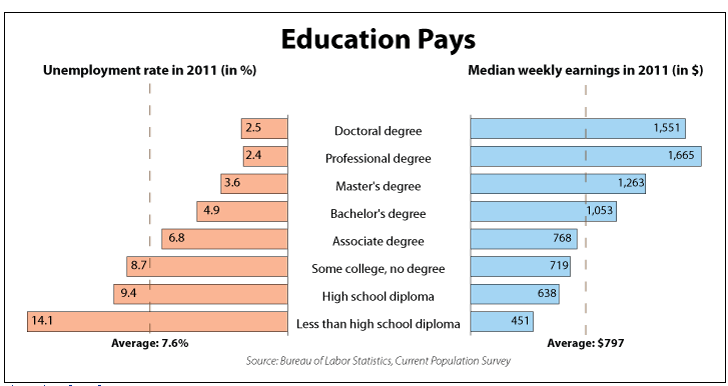 Consider the following chart….it really does “pay” to increase your education! Many of our Career-Technical Education (CTE) classes are eligible to receive articulated credit at North Carolina community colleges. In order to qualify, you must make a B in the class and score a 93 or above on the end of course exam. The following courses are eligible for articulated credit for Haywood County School students. The individual high schools offer different courses, so check with your counselor to be sure what you may be eligible to receive. North Carolina Career and College Promise (CCP) program is available to high school students who will be Juniors or Seniors wanting to earn Free college credit. Career and College Promise provides seamless dual enrollment educational opportunities for eligible North Carolina high school students in order to accelerate completion of college certificates, diplomas, and associate degrees that lead to college transfer or provide entry-level job skills. To apply, students will need to complete a CCP application and see their high school counselor to determine eligibility.